If you’re looking for a quick, simple, healthy, high protein snack/meal we have one for you. You’ll be hard-pressed to find a simpler way to get a small meal/snack in than this. It super simple and thanks to our friends at Chobani, it’s even easier with their conveniently packaged products. Check it out, give it a try and let us know how if you add/change anything to make it even better. 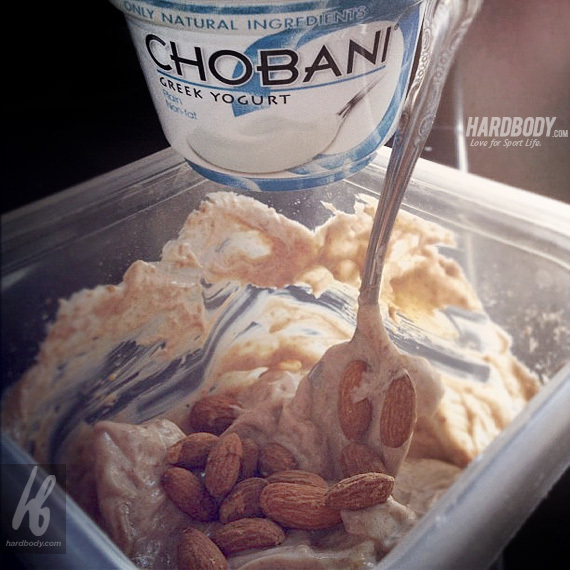 Empty the Chobani Greek Yogurt into a bowl. Don’t try adding the ingredients to the Chobani cup, there’s not enough room for the protein powder. We know because we made that mistake. 🙂 Add one scoop of your favorite protein powder to the box. We used Optimum Gold Standard Whey -Chocolate Malt this time but you can use whichever you like. Mix it until all the protein powder has been whipped into the yogurt. Then add your almonds (we prefer Blue Diamond almonds but again any brand will work) as many or as few as you like depending on your dietary needs. That’s it. Simple, right? Totally. A look at the healthy snack, all mixed up.